This article is about Indian television actress. For the actress in Nach Baliye 5, see Mahhi Vij. Meher Vij is an Indian film and television actress. She is the recipient of a Filmfare Award. She played supporting roles in the drama film Bajrangi Bhaijaan (2015) and the musical drama Secret Superstar (2017), both of which rank among the highest grossing Indian films of all time; for the latter she won the Filmfare Award Best Supporting Actress. She has appeared in television shows including Kis Desh Mein Hai Meraa Dil and Ram Milaayi Jodi. Vij has an elder brother, Piyush Sahdev. In 2009, she married Manav Vij in Mumbai. ^ "All you need to know about Shuddh Desi Romance star Sushant Singh Rajput". ^ "Indian TV stars celebrate Rakshabandhan". ^ "Real-life telly Siblings celebrate rakhi". ^ "Love Calling - Yeh hai Aashiqui". YouTube. ^ "Winners of the Filmfare Awards 2018". Filmfare. ^ "Lions Gold Awards 2018: Complete winners list and Red Carpet pictures | Free Press Journal". Free Press Journal. 25 January 2018. Retrieved 21 March 2018. 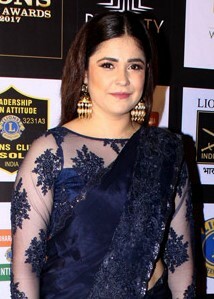 ^ "Meher Vij - Best Supporting Actress". Instagram. ^ "Star Screen Awards - Meher Vij". Twitter. ^ "Zee Cine Awards 2018 complete winners list". The Indian Express. ^ "List of Power Brands Bollywood Award Winners". Power Brands. ^ "Power Brands Bollywood Film Journalists Awards 2018". News18. This page was last edited on 9 April 2019, at 21:47 (UTC).